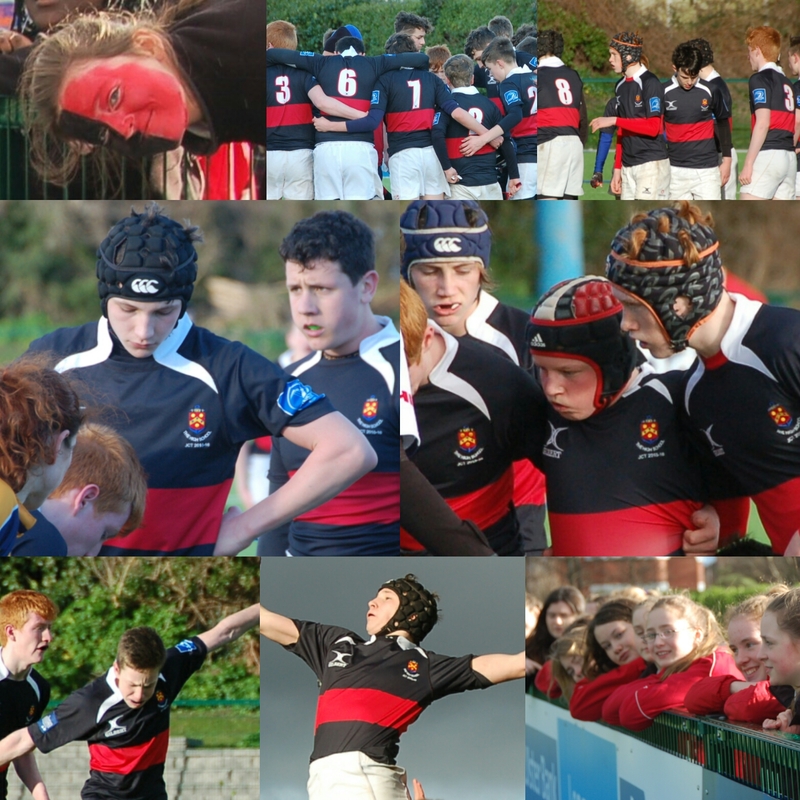 The High School Grand Christmas Draw, in aid of the senior rugby tour to South Africa, June 2016, raised just over €6,500. Mr Forrest drew the winning tickets in the reception in The High School late last week, aided by HSD's own Ireland rugby internationals, Mr Sullivan and Ms Deacon. Many thanks to all who brought tickets. Congratulations to High School teacher Ms Deacon who has been selected for the Ireland Women's Sevens Squad For Sydney. Say hello to the new Dublin Junior Boys' Badminton Champions! The school is enjoying terrific badminton success again this year. The Senior Boys' Badminton team, were recently named Dublin Champions, and went on to take silver in the Leinster Badminton Final. This success was repeated last week when the Junior Boys' Badminton team were also crowned Dublin Badminton champions. The Junior Team beat De La Salle 6-0 in the Junior Final to become Dublin champions and and now look forward to competing for the Leinster title on 1 March in the Baldoyle Badminton Centre. This is the first time that the High School has won both the Dublin Junior and Senior Boys' Championships in the same year. We congratulate them on this fine achievement and wish them every success in future games. Congratulations to The High School Athletics Team who participated in the East Leinster Cross Country Championships in Rathdrum, Co Wicklow this week. 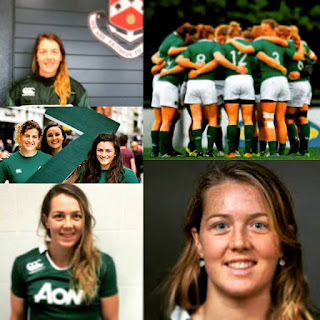 Three individuals qualified for the Leinster Championships: Roseanne McCullough , Aela O'Flynn and Clara Wilson . Well done to everyone involved. 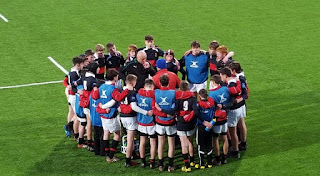 Excitement was building all week at The High School prior to the match in Clontarf, which saw the school's Junior Cup Team face their opponents from Gorey Community School in the Bank of Ireland Schools Fr Godfrey Cup semi-final. 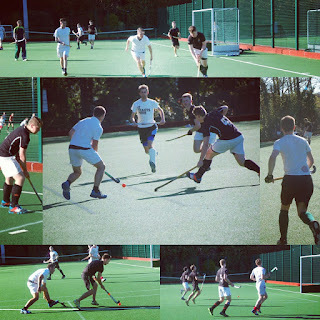 Despite a valiant effort, the game did not go in The High School's favour and the final score saw their opponents go forward to the next round. Thanks to the coaches, teachers and pupils who turned out on a blustery day to support the team, and to the players themselves, who gave their all in this and every game played in the tournament. The High School Senior Boys' Hockey team played really well in the Cup Semi-Final yesterday afternoon with a super reverse stick goal by Peter Lynch. Final score 5:1 to Andrew's. Well done lads for getting so far in the competition. A team from The High School has won the Dublin Branch Team Maths quiz! 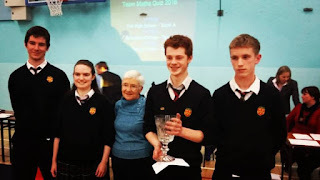 This is a maths table quiz organised by the IMTA (Irish Maths Teachers' Association), based on the Leaving Cert course. They have now qualified for the National Finals in March. A second team from the school were placed joint 5th, out of 48 teams from around Dublin. Well done to all. 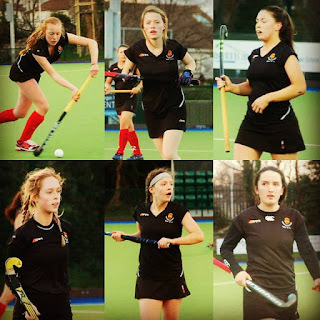 The Senior 1 Girls’ Hockey team played against Rathdown Senior 1’s earlier this week in the second round of the Leinster Schools Cup Competition. We trained and progressed very far this season, to prepare for a tough opposition in such an important competition. Sadly, despite all of our hard work and efforts, we lost 2-1 to this very challenging side. 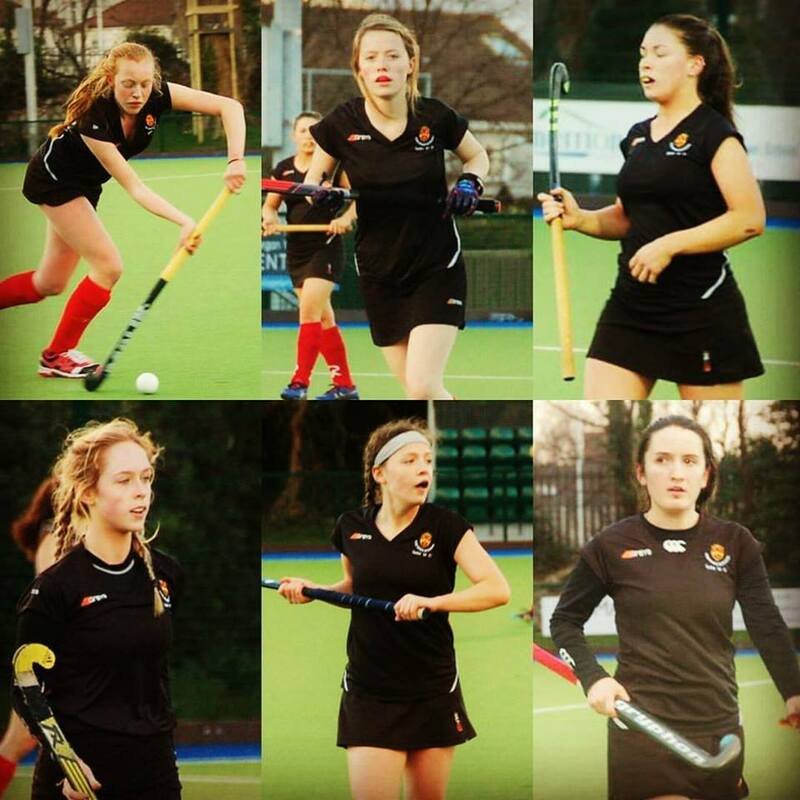 Our goal came from E. Ridgeway who made a break in the second half, bringing us closer to Rathdown’s two- goal score. C. Harris earned herself ‘man of the match’ after being on her toes from the start and making many, very tricky saves. We still have the Plate to fight for, as we hope to progress even further in the competition. 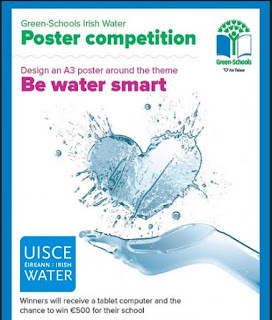 Entries are to be designed around the theme of "Be Water Smart", supported by An Taisce and Irish Water. The A3 poster can be a combination of words and illustrations or just illustrations. There will be regional and national prizes, where a personal tablet computer and a €500 school Green-Schools fund can be won. On the reverse side, please write your name, form, age, and school. Submit entries to Mr Barry or a member of the Green Schools Committee by Monday 8 February. 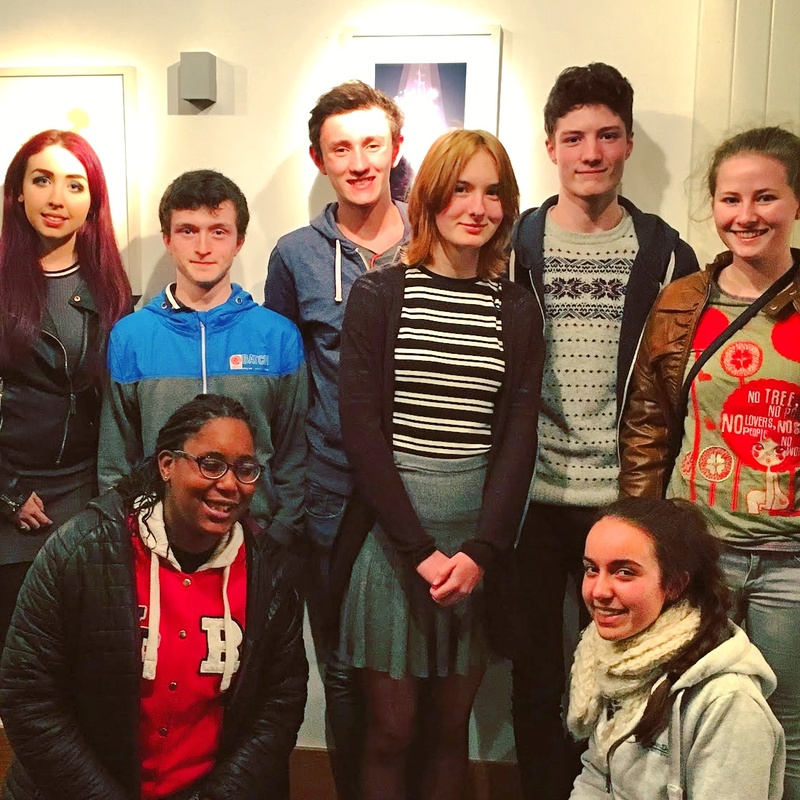 A group of Form 4 pupils recently went to the theatre to see an excellent adaptation of Tennessee Williams’ play ‘Cat on a Hot Tin Roof.’ The play was in the Mill Theatre in Dundrum. Mr Milofsky decided to take us as part of the Transition Year Drama option. The play is set on a plantation in the Mississippi Delta in America. The story focuses on the relationship between husband and wife, Brick and Maggie. 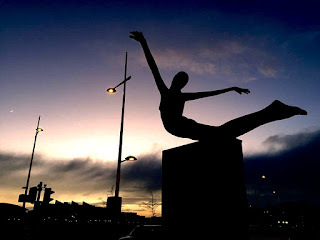 There are several recurring themes such as addiction and greed. We thoroughly enjoyed the play and the acting, particularly the amazing Maggie. We would like to thank Mr Milofsky for organising the trip. It was a great night. 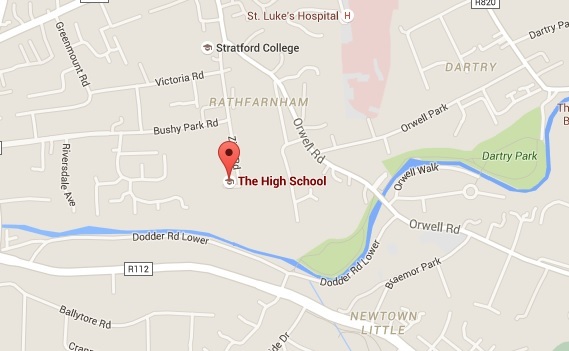 The High School Dublin - 6th Year Final Assembly 2015. 'Singing their goodbyes'. 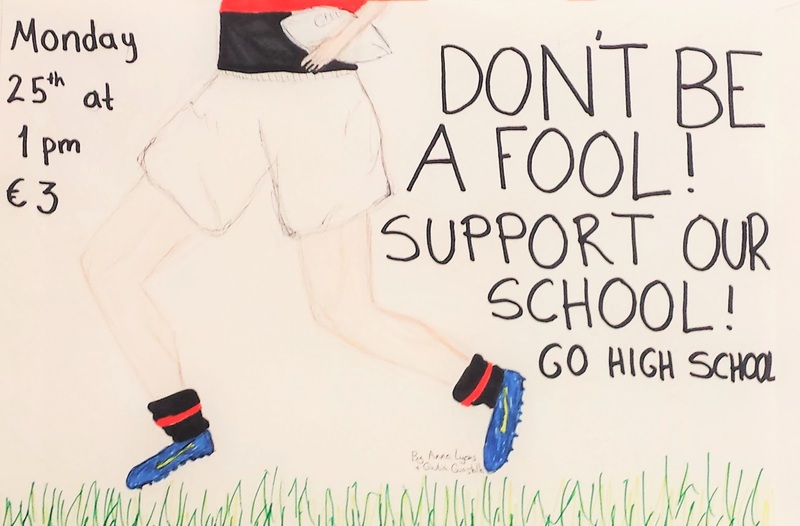 There are some of the posters decorating the walls of The High School today as the school gets ready for the next round of the Fr Godfrey Cup, when HSD takes on Gorey in the semi-final. 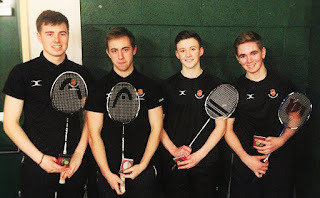 Congratulations to The High School Senior Boys' Badminton team who made it to the Leinster Badminton Final. Unfortunately luck wasn't on their side this time in a nail-biting game that really showed their metal. Here they are photographed with their runners-up medals. We are so proud of this great achievement. Congratulations to the Senior Debating team who won their debate against Sandford Park School last Thursday. This was part of the league phase of the Concern Debate Competition. The motion was that "HIV and AIDS will be eradicated in our lifetime". We were against the motion and presented arguments about the links between HIV/AIDS and poverty, the stigma surrounding these problems and the medical difficulties of eradicating HIV/AIDS. Our next debate will be on Thursday 21 January at The High School. We are debating against Dominican School on the motion "The EU can well afford to open its borders to refugees". 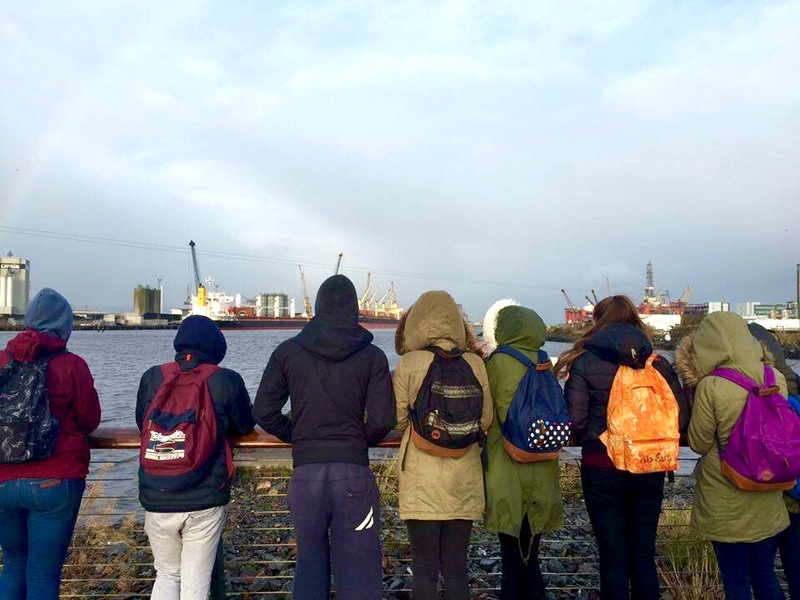 Bright and early on Tuesday 12 January, the Form 4 classes and eight teachers met at Connolly Station. We caught the 9.35 Enterprise train to Belfast Central station excited for the tiring day ahead of us at the Titanic Exhibition in Belfast. After a long train journey filled with card games and monopoly, we reached Belfast Central station at 12am. We then caught another train to the Titanic Quarter, soon arriving at the Titanic experience. 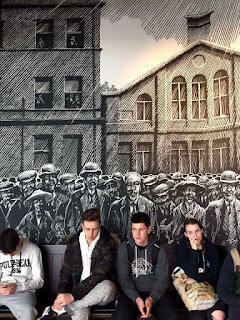 We were split into four groups and then we visited different exhibitions within the museum. The first exhibit illustrated what life was like in Belfast during the early 1900s, when the Titanic was being built at the docklands outside. walked! Heading home, we caught a short train back to Belfast central, and much quieter journey later, 120 exhausted students arrived at Connolly station, ready to head home. Congratulations to the Senior Girls' Cross Country team which finished in first place and were awarded gold medals at the Clan na Gael races. The Senior Boys' Cross Country team finished in third place and were awarded bronze medals. 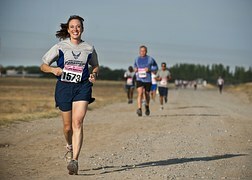 We wish all our athletes continued success throughout the season. 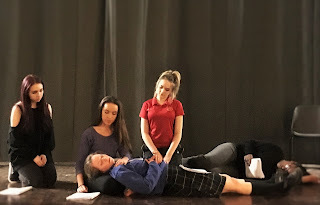 Rehearsals are well under way for this year’s entry into the St. Andrew’s College One Act Drama Festival. This is the second year in a row that The High School will be competing in the event, which is sure to be as exciting as before. For our 2016 entry, the HSD One Act Drama Company will be performing A Debt Too Far, our ensemble edited and devised version of Sophocles’ classical drama, Antigone. 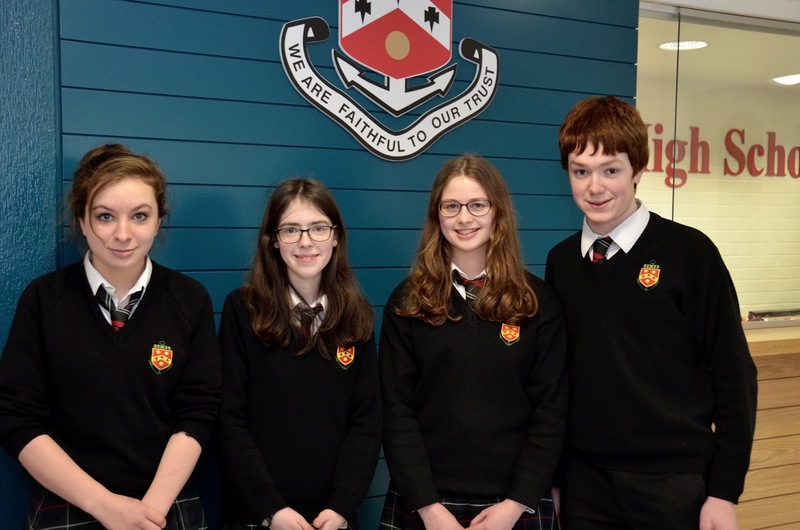 The competition will be held across 9,10 and 11 February in St. Andrews College, Booterstown (performance dates for each school’s entry to be confirmed). Keep an eye out for information around the school. 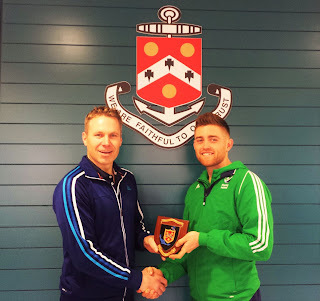 Past pupil and FHI nominated Rising Star of the year, Shane O'Donoghue, stopped by The High School today to speak to pupils at junior assembly about being a professional hockey player, wearing the Irish jersey 94 times and his thoughts as he prepares for the 2016 Olympics. Here he is on the right being presented with a special plaque by High School teacher, Boys' Hockey coach and Ireland international hockey player, Mr Paul Fitzpatrick. “Help Your Child Achieve Academic Success!” - You are invited to attend this one hour talk by Student Enrichment Services Ltd.on 14 January at 8pm in the Reynolds Hall. This talk is tailored specifically for parents on how parents can assist their children and will contain simple and practical ideas to how parents can achieve that. Ever wondered who the HSD Parents’ Association are and what they get up to ? 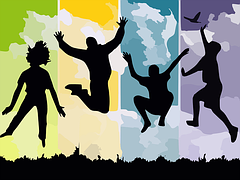 Click here to view the NEW Parents’ Association portal for 2016 : We hope you like it! of interest to other parents of pupils at the school. We have also published the new rules for the Parents Association which were approved at the AGM last October. The retirement of Mrs King as librarian at The High School, after 32 years of dedicated service, was celebrated at a special assembly on Monday the 21st December 2015 in the school gym. During the extraordinary whole-school assembly, which was attended by many former staff and pupils, tributes were paid to Mrs King to thank her for her loyal service to The High School community over the past three decades, in charge of the oasis that is The High School library. Contributions were led by Mr D Miller, who, along with current and former pupils, acknowledged her immense contribution to the life of the school, and for the kind, caring and creative manner in which she has fulfilled her role as librarian. to lend a hand, or simply hear you out, whether pupil or staff, past or present. There has hardly been a minute that passed in the library without hearing a joke, a laugh or a word of affirmation from her. Absolutely no one could be more kind, caring, considerate and understanding than she, and the library would certainly not have been the same without Mrs King. We wish Mrs King, and her husband Robert, our congratulations and all the very best for her retirement.